If you are currently looking for Juhi Chawla, then here's where you can find her. The 50-year-old actress is chilling (like literally) in Austria and updating her Instagram with postcard-like posts from the holiday destination. In her latest post, the actress, dressed in a red jacket and fur cap, can be seen skiing with her sister-in-law and the Internet can't get over how cute she looks in the photo. "You are so cute," read a comment while another added: "You look so cute in this getup." Sharing the photo, Juhi wrote: "With my sister in-law Trishala, and Dieter, our guide who made it so much fun... actually, I fell down in the snow, more because he was joking and making us laugh so much!" With my sister in-law Trishala , and Dieter, our guide who made it so much fun ... actually , I fell down in the snow , more because he was joking and making us laugh so much !! 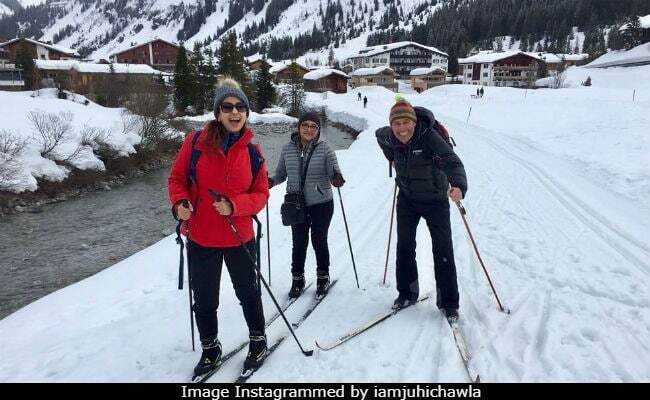 Juhi Chawla, who spent Easter Sunday in Austria, also updated us about how the day's itinerary looked like for her. Sharing a selfie, she wrote: "Saw those lovely, very cute Easter decorations outside the restaurant where we had fondue for Lunch. Haus 8. Happy Easter." Last week, snowfall in Austria at this time of the year had Juhi Chawla surprised. "Early morning here... it's like mid-winter... completely snowed in... and snowing all day today... very strange because it's the 29th of March," she Instagrammed with another selfie (of sorts). Nevertheless, she is having a great time in the European country. Well, with a view like this at your dinner table, who would not? In Bollywood, Juhi Chawla was last seen in Chalk n Duster. Her line-up of films include Ek Ladki Ko Dekha Toh Aisa Laga, in which she co-stars with Anil Kapoor and Sonam Kapoor. Juhi Chawla, who has co-starred with Shah Rukh Khan in several films before, also has a cameo in the King Khan's upcoming release Zero.